I quite enjoyed Rope Racers (Free) in my review last week, and in fact I’m still playing every day. Flying through each level via ropes and trying to beat nine other people to the finish is incredibly fun, but unfortunately the game has just about every free-to-play mechanic you can think of. There’s a slot machine, two currencies, a stamina meter, and several other timers. It’s far from the worst I’ve seen, but it can hamper your progress if you’re not careful. Fortunately, I managed to unlock all 20 leagues and most of the characters since it came out, and I’ve compiled some of the tips and tricks I used below. Swinging is all about momentum, so once you get going don’t let anything stop you. Obviously you should try not to hit pinball bumpers and lava, but also be careful not to hit ceilings and floors. You want to the smoothest “line” through each level as possible. And speaking of levels, many of them have shortcuts–a few of which are almost guaranteed to get you first place if you’re reasonably careful through the rest of the level. It’s usually a good idea to explore each new level you come across to see what the best path is without worrying about the racing at first. This can make a huge difference in the long run. One rather specific technique for getting a great time is to whip yourself out of blue shafts. Many of the levels have them, and they’re designed to carry you up and shoot you into the next area of the level. Most people simply ride them out, but if you hook your rope to the inside wall just before exiting, you’ll swing over the top with tons of speed. And don’t forget to let go at the last second! Finally, ignore your run stat. I mean, sure, it’s nice if you have a character who can run quickly when you fall or get stuck somewhere, but it’s far more important to just practice avoiding situations where you have to run. In other words, take to the skies and don’t look down. There are 30 different characters in Rope Racers, and each has several upgraded versions that change their appearance and stats. 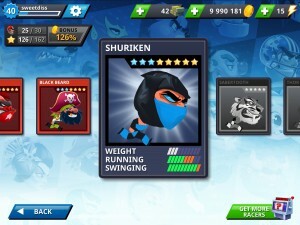 Each also has a star rating to show its rarity and level, with ten common (one star) characters, eight uncommons (two stars), five rares (three stars), four epics (four stars), and three legendaries (five stars). Each character also has three additional stars that can be added to the original amount to show your character’s power after upgrades. These upgrades typically add up to four stat points, spread across Weight, Running, and Swinging. The prices for these upgrades may seem slightly outrageous at first, but trust me–if you stick with the game, you’ll be earning way more than you can possibly spend eventually. Interestingly, I’ve honestly never been able to tell the difference between the base character and its upgraded version, as they all seem to feel pretty much the same. It’s still worth it, though, just to see the way the characters’ appearances changes (and for the additional stars–you’ll see why soon!). New characters are obtained through a slot machine, with common characters being the easiest and legendaries being the most difficult (as you’d expect). Luckily, since there are only 30 characters total, you’ll soon run out of the more common ones and start getting rarer characters more often. You can also get a 5,000 coin pack in the slot machine, but eventually you’ll get to the point where 5,000 is basically nothing and it just serves to slow down the rate you collect epics and legendaries. 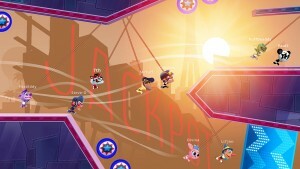 Rope Racers has two main currencies: Coins and bucks. Coins are the game’s “soft currency” and are used on character upgrades and race entry fees, while bucks–the “hard currency”–are for interacting with the free-to-play stuff like the slot machine and stamina timer. You gain coins by winning races (and occasionally through the slot machine, as noted earlier). The amount you earn for a first place win is always double the amount of the entry fee, which basically means your net gain will be half of what it says. For second place the amount won is less, and for third place you’re basically just earning back what you paid to enter. If you place outside of the top three you’re losing money, which doesn’t feel great. As for bucks, these are earned 10 at a time by completing daily missions. 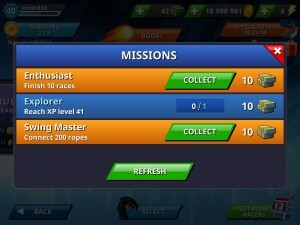 These missions are usually pretty easy to complete, like “connect X amount of ropes” or “win two races in a row”. (Always refresh it when you have the option! Don’t get hung up trying to complete a difficult objective when you can easily get three more that are worth the same amount.) There’s also a daily reward just for opening the app every 24 hours, and while the amount varies, you can always double it by watching a video ad. Finally, most levels have bucks floating in the air that can be collected. Waiting is free! 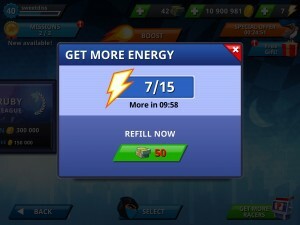 Don’t ever spend hard currency to refill a stamina or energy timer in a free-to-play game. Hard currencies are usually quite rare (comparatively), and chucking them at timers is a fantastic way to completely run out and be left with nothing. Rope Racers’ energy timer consists of 15 bolts of electricity, and it costs one to play a race. That may seem like a lot of energy to play with, but it runs out much quicker than you think considering each race is usually about 30 seconds long. It takes 10 minutes to refill each bolt, too, so you could be waiting up to two and a half hours to fill it completely. The best advice I can give for dealing with the energy timer is to just find another game and play that for a while. If this is your first time to Touch Arcade, might I suggest perusing our incredible forum community for game recommendations? I usually don’t play a lot of the games I review for very long after the review goes up (even if I like them! ), because there are just too many on the App Store, with tons more coming almost every day. Despite that, Rope Racers has managed to make its way into my daily rotation for weeks now. It’s super fun and incredibly compulsive, even though it has nearly every free-to-play system I can think of. Hopefully this guide will help you understand how those system work and–more importantly–how to use them efficiently to get more bang for your virtual buck. Happy swinging!